1,067 pages | 351 B/W Illus. Used routinely in drug control laboratories, forensic laboratories, and as a research tool, thin layer chromatography (TLC) plays an important role in pharmaceutical drug analyses. It requires less complicated or expensive equipment than other techniques, and has the ability to be performed under field conditions. 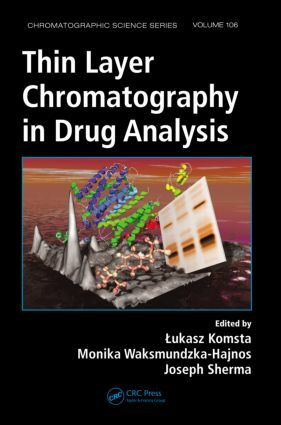 Filling the need for an up-to-date, complete reference, Thin Layer Chromatography in Drug Analysis covers the most important methods in pharmaceutical applications of TLC, namely, analysis of bulk drug material and pharmaceutical formulations, degradation studies, analysis of biological samples, optimization of the separation of drug classes, and lipophilicity estimation. The book is divided into two parts. Part I is devoted to general topics related to TLC in the context of drug analysis, including the chemical basis of TLC, sample pleparation, the optimization of layers and mobile phases, detection and quantification, analysis of ionic compounds, and separation and analysis of chiral substances. The text addresses the newest advances in TLC instrumentation, two-dimensional TLC, quantification by slit scanning densitometry and image analysis, statistical processing of data, and various detection and identification methods. It also describes the use of TLC for solving a key issue in the drug market—the presence of substandard and counterfeit pharmaceutical products. Part II provides an in-depth overview of a wide range of TLC applications for separation and analysis of particular drug groups. Each chapter contains an introduction about the structures and medicinal actions of the described substances and a literature review of their TLC analysis. A useful resource for chromatographers, pharmacists, analytical chemists, students, and R&D, clinical, and forensic laboratories, this book can be utilized as a manual, reference, and teaching source. Lukasz Komsta currently serves as assistant professor in the Department of Medicinal Chemistry, Faculty of Pharmacy, Medical University of Lublin, Poland. His research interests include the theory and application of liquid chromatography, especially in connection with computational chemistry and chemometrics, as well as the application of chromatographic methods, especially thin layer chromatography (TLC), in the analysis of drugs. Dr. Komsta is the author or coauthor of more than 80 scientific papers and about 70 scientific conference papers. Since 2011, he has been a member of the editorial board of the journal Acta Chromatographica. He also serves as section editor for the Polish scientific journal Current Issues in Pharmacy and Medical Sciences. Monika Waksmundzka-Hajnos currently serves as full professor of pharmacy and head of the Department of Inorganic Chemistry at the Faculty of Pharmacy of the Medical University of Lublin, Poland. Her research interests include the theory and application of liquid chromatography, taking into consideration the optimization of chromatographic systems for the separation and quantitation of drugs and their degradation products in pharmaceutical preparations and drugs and their metabolites in body fluids, as well as isolation and/or separation of secondary metabolites in extracts of plant tissues. Professor Waksmundzka-Hajnos is the author or coauthor of about 150 papers, approximately 300 conference papers, and several chapters in known chromatographic textbooks. She is editor of the journal Acta Chromatographica and a member of the editorial board of Journal Planar Chromatography – Modern TLC. Since 2011, she has been a member of the editorial board of The Scientific World Journal—Analytical Chemistry. Professor Waksmundzka-Hajnos is the co-editor of two books from the Chromatographic Science Series: Thin-Layer Chromatography in Phytochemistry (2008, with Teresa Kowalska and Joseph Sherma) and High Performance Liquid Chromatography in Phytochemical Analysis (2010, with Joseph Sherma). Joseph Sherma is currently John D. and Francis H. Larkin Professor Emeritus of Chemistry at Lafayette College, Easton, Pennsylvania. Professor Sherma has authored, coauthored, edited, or coedited more than 750 publications, including research papers and review articles in peer- reviewed journals; approximately 30 invited book chapters; and more than 70 books and U.S. government agency manuals in the areas of analytical chemistry and chromatography. In addition to his research in the techniques and applications of thin layer chromatography, Professor Sherma has a very productive interdisciplinary research program in the use of analytical chemistry to study biological systems with Biology Professor Emeritus Bernard Fried. Professor Sherma served for 23 years as editor for residues and trace elements of the Journal of AOAC International and is currently that journal’s Acquisitions Editor.